Brighten mornings with family with these #FlavorYourFun dishes. Despite the constant reminder that breakfast is the most important meal of the day, many still turn to bowls of cereal or granola bars due to their hectic schedules. While these no-cook breakfasts can get you through the morning rush, a filling breakfast will sustain you and your family for much longer. Conagra Brands make breakfast a family affair once more with these four easy-to-cook meals. Showcasing a variety of textures plus savory and sweet flavors, the arroz a la Cubana may seem like an intimidating dish to cook, but a can of Hunt’s Tomato Sauce can make cooking this a lot easier. Its rich blend goes well with ground beef, peas, and other diced veggies. Adding this Conagra product can help you make an unforgettable arroz a la Cubana meal. 1 Prepare two pans, spray both with PAM Olive Oil. 2 In one pan, cook onions and garlic, then add the ground beef. Once light brown, drain the excess fat. 3 Add Hunt’s Tomato Sauce, soy sauce, water, and sugar. Bring to a boil. 4 Add green peas and let the ingredients cook for another five minutes. 5 While waiting, fry the saba bananas in the second pan. 6 Use the same pan where the saba bananas were cooked to make sunny-side-up eggs. 7 Assemble ingredients from both pans on a plate. Serve with a cup of rice. Sure, everyone comes up with all sorts of shapes for breakfast waffles, but why not bring in even more creativity? Top your perfectly cooked waffles with fresh strawberries and a generous amount of low-calorie Reddi-Wip whipped cream. And, if your family has a sweet tooth, complement their waffle meal with a cup of Swiss Miss Hot Chocolate that’s topped with more Reddi-Wip and a sprinkle of cinnamon powder. 2 Prepare two bowls for the waffle batter. In the first bowl, beat eggs, then add margarine, and vanilla. 3 In the second bowl, mix together flour, salt, sugar, and baking powder. 4 Mix contents of the two bowls, and pour batter into waffle iron. 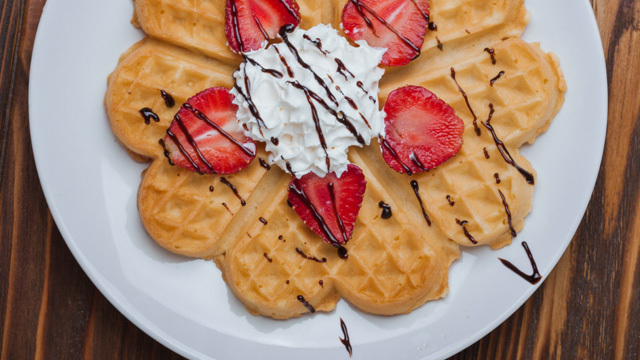 5 When the waffles are done, let them cool on a plate, top with Reddi-Wip and fresh strawberries. “Rice is life,” as Pinoys would say, so here’s another rice meal for breakfast! Start your family’s day with a bowl that’s got the right balance of rice and ulam while packing in a whole lot of protein. For the ulam, you have scrambled eggs and slices of Libby’s Vienna Sausage. Packed with flavor, these sausages promise a delicious meaty dish that’s quick and easy to prepare. 1 Fry Libby’s Vienna Sausages in a pan with Blue Bonnet margarine and garlic until the skin turns darker. 2 Add the leftover rice and mix everything thoroughly. 3 Put in serving bowl and top with scrambled eggs and basil leaves or your choice of herbs. You could never go wrong with the classic corned beef, onions, and potatoes combo. 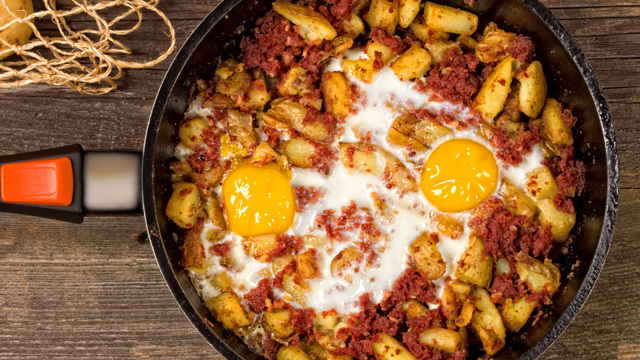 Make this sautéed creation the star of your morning by letting Libby’s Corned Beef and diced potatoes sit and crisp in the pan. To add texture to this tasty ulam, serve it together with a sunny-side-up egg and a cup of garlic rice. 1 Spray heated pan with PAM Olive Oil. 2 Sauté onions and potatoes until they turn golden and tender, season with salt and pepper. 3 Mix in Libby’s Corned Beef, spread the mixture evenly and let it crisp. 4 Crack two eggs on top of the crunchy hash and let them cook. For more breakfast ideas, other recipes, and information about Conagra, visit its website and follow the brand on Facebook and Instagram. This article is sponsored by CONAGRA.